Due to global warming, Japan is warmer than last year. This year, the sakura season comes a little bit earlier than before. In March, our tour visited Kansai area where we could see pretty sakura in Kyoto, Nara and Yoshiyoyama. Every April, the influx of tourists comes to Japan to enjoy the Sakura blossom. Many customers are surprised that the sakura is not pink while it is pale pink instead. In fact, there are over 600 varieties of sakura in Japan. The most common sakura is called Yoshino sakura and it is a pale pink while Shidarezakura is also pale pink and all around Japan. 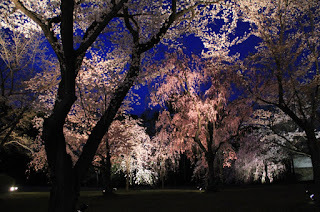 The most memorable moment for me to see the pretty sakura is to see the sakura at night. In every city of Japan, it has some light up events during the week of cherry blossom. The pictures shown here are all taken in Nijo Castle, Kyoto light up event. If you have a chance to visit Kyoto, please do not miss it.